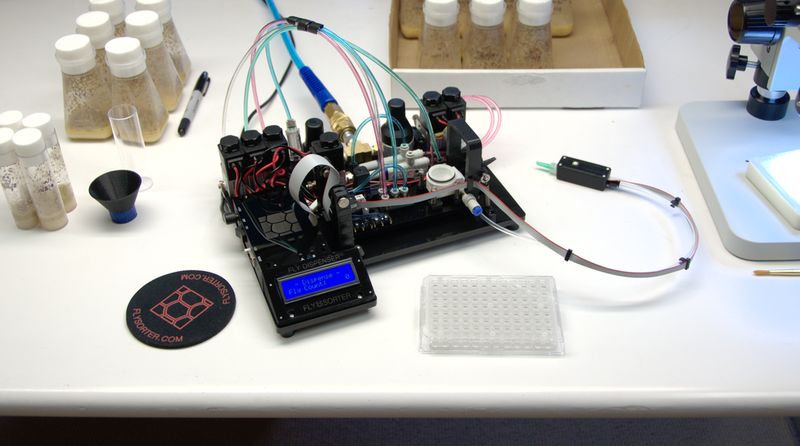 FlySorter is proud to release the second version of its groundbreaking fly dispensing device, which is the key to automating a variety of Drosophila tasks. The Fly Dispenser Mk2 is available now for $3,950 and can release one (awake, non-anesthetized) fly at a time every few seconds, from a vial containing hundreds, without the use of CO2. The Fly Dispenser Mk2 uses a patent-pending mechanism to safely and quickly isolate an individual fly and then gently puffs it through a tube. You can use the device to load experiments, to count populations, or as part of a larger, automated system. The system provides both a manual and USB interface, so you can use the Fly Dispenser as a standalone device or as a module within a bigger system. In manual mode, press the button at the end of the tube and a fly is dispensed; in USB mode, text commands control the Dispenser. In this latest iteration, we have improved reliability and usability, and also made the device quieter during use. What can you do with a Fly Dispenser? The Fly Dispenser's patent-pending design uses positive and negative pressure air to hold a single fly against a precision shuttle, and clears other flies away as the shuttle moves to an isolated location. This mechanism is the result of countless hours of prototyping and experimentation; we've dispensed hundreds of thousands of flies! Using an array of precision-milled, 3D printed, and laser-cut parts, each mechanism is assembled and tested in-house, and the machine is covered by our money-back guarantee. Maintenance is easy - use the included tools to disassemble the funnel and shuttle; clean with soap and water; then put everything back together. 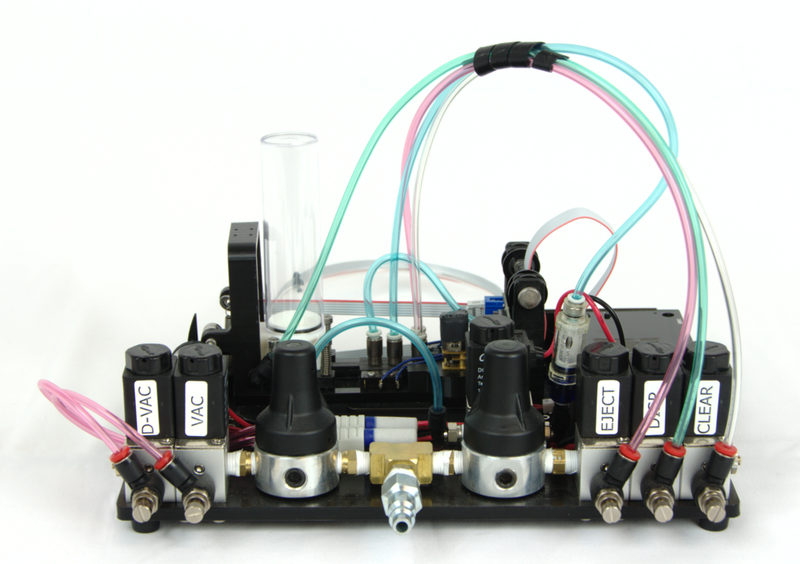 The built-in pressure sensor allows for repeatable periodic calibration and tuning (only required if using different species or in a custom system).